At a media event held today, Facebook announced a new push into mobile, bringing updates to the company's Android and iOS applications and rolling out a new single sign on service that will allow users logged into the company's applications to also access other applications such as Flixster, Groupon, and Loopt. Single sign on is currently available on a handful of Android applications, with support for iPhone apps coming soon. On the iOS front, Facebook announced an update to its application for the iPhone and iPod touch, bringing support for the enhanced "Groups" functionality rolled out recently and new features for the "Places" functionality, including the ability to find deals and a new option to "star" friends in the Places list to make it easier to check in with them. 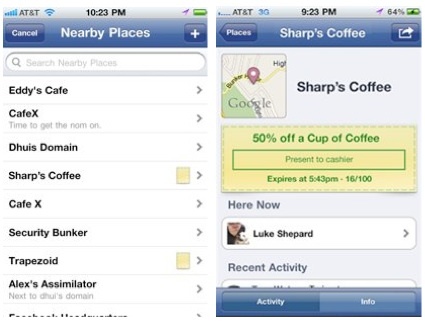 Using Places on the iPhone already lets you share where you are and find nearby friends. Now with the iPhone 3.3 application, you can also find nearby deals from your favorite businesses--from restaurants down the block to major retailers. Deals are only available from Places in the U.S, for now, and we'll be expanding them to more merchants over time. The updated Facebook application should be available in the App Store later today, although the the application currently appears to be entirely unavailable. When asked about Facebook's plans for an iPad application, Facebook CEO Mark Zuckerberg revealed that the company does not consider the iPad to be a mobile device. When pressed on the issue, Facebook executives noted that they are still trying to understand the best approach to take for tablet devices like the iPad. The real hint to Facebook's iPad plans, though, is that Tseng focused on the form factor and not iOS. This could mean that Facebook's looking to build an HTML5 version of its website optimized for tablets. At the very least, Facebook seems intent on keeping a consistent experience across all tablet devices. In the meantime though, Tseng points out that Facebook is accessible via the iPad through the official website (which is pretty darn functional) and through touch.facebook.com. Zuckerberg then clarified that Facebook was attempting to keep the focus of the event on mobile, and the company simply doesn't see the iPad as being in the same class as "mobile" devices like the iPhone and Android. Update: The new version of Facebook has now gone live [App Store] as Version 3.3.1. Hope they cut down on the spammers and raise their privacy standards. Apparently Zuckerberg doesn't get the trend of what people use their iPads for. Most people don't want to use Safari to load Facebook because of a lack of certain functions, such as a photo/video upload, a lack of Chat, buggy poke/dialogue boxes, and a bunch of other problems. I don't understand why the FB dev team can't just take the iPhone app (which is currently on my iPad) and iPad-ize the graphics. That's all that's really needed. I don't see facebook as "relevant" or "worth my time." 90's had geocities, 00's had myspace, 10's have facebook. Privacy is a nightmare, spam is ridiculous. Just my opinion. I'm sure I'll be blasted, but don't bother; I won't be checking back. Hopefully they don't try to force their stalker feature (Places) onto people in the new version. That should be opt-in, not opt-out. Zuckerberg is becoming almost as creepy as Eric Schmidt. Why would you need to upload video or photo from iPad to Facebook. You can't take any video or photos with the iPad. You must not be familiar with the iPad Camera Connection Kit (http://store.apple.com/us/product/MC531ZM/A)? Out and about using iPad -- definitely mobile. You couldn't pay me to use Facebook, in any fashion. I value my privacy too much. Oh, same with Google too. ...Great. Update put a Check In button up in the new menu bar where you used to post status/photo updates. No way to disable it as far as I know either. I am familiar with it. But I also know that the subset of people who have an iPad, camera connection kit are few. And you do know that you can email photos and videos to facebook to upload right? I hate workarounds. Maybe you could stop apologizing for Zuck long enough to realize people expect better quality and functionality these days than FB seems to be able to deliver?